Matthew Monahan, Grand Falconer, 2012, patinated bronze, patinated polished stainless steel, 118 x 58 x 31”. Matthew Monahan’s debut solo exhibition in Japan unfolds within a two-toned gallery—a subterranean realm of unfinished concrete on the left, and a serene, elevated dais covered in tatami straw mats on the right. 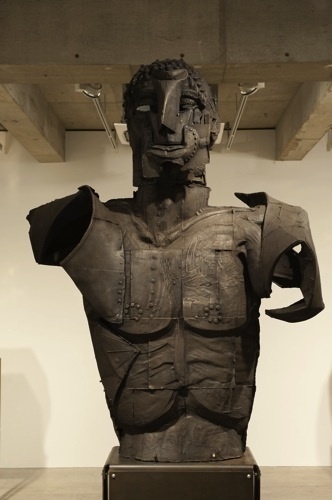 A jagged assemblage of a mask obscures the majestic visage of Grand Falconer (all works 2012), a towering, centurion-like bronze and stainless steel figure, while the seemingly hefty mass of its robust torso in fact conceals a hollow, extruded interior. The brass and patinated bronze Throne 1 and Throne 2 expand on Monahan’s ongoing series of folded prints, where single sheets of paper were carefully creased to create the furrowed ridges of a face. Here, crinkled metallic sheets are gingerly laid over a pedestal to create the impression of a crumpled, imploded face, while the hollow blackness of their underside hints at the horror of the void at the heart of a seemingly solid volume. While Monahan’s professed debt to the devotional figures and religious portraits of painters like Grunewald and Cranach partially explains the pathos found in the facial expressions of several of these works, the splayed plaster figures in the tatami room that have been impaled on their own jagged steel armatures—as if tortured by the corporeal weight and heft of their own supports—hint at more complex psychological traumas and a splintering of the once-unified subject. Takashi Murakami, who invited the artist to do this exhibition at Kaikai Kiki in 2007, claims that Monahan’s work resonates with “our own innate sense of flatness.” Although it’s hard to pin down exactly what that might mean, the illusory impressions of multiple surfaces, icons, and likenesses that seem to cycle through these pieces collapse (or flatten) space and time, chaperoning us through a comprehensive gathering that looks both back at antiquity and forward to a cyborg, postbodily future. Between the crumpled pleats and lines of Monahan’s folded figures, we glimpse the anxiety of an archivist working to retrieve something of every age in a battle against forgetfulness, and against the tyranny of a perpetually contemporary present.